Looking to have a retaining wall installed? Reclaim an unusable slope with a retaining wall and possibly steps. 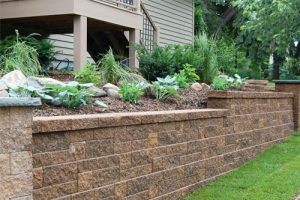 Installing a retaining wall can transform an unusable tract of land into a functional area. A slope can suddenly become a beautiful, usable area. We make it easy for you to arrange appropriate elements into a pleasing design for your home or business. Proper drainage behind the wall occurs through a sand or gravel backfill and sometimes a drainage pipe is installed, depending on your needs. We offer limestone, flagstone, sandstone, bluestone, boulders and concrete. In the past, landscapers chose from natural fieldstones, solid concrete walls and railroad ties to build these walls. These walls are made up of blocks that are decorative as well as structural. They can be used to construct walls reaching major heights as well as more modest walls. If you’re looking for a landscaping contractor who can get your retaining wall installed the right way and at a reasonable price, contact Ecoscaping today.